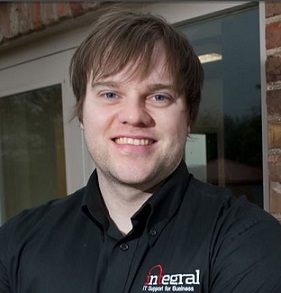 Self-confessed IT geek Jonathan Edwards has been growing his business, Integral IT Ltd, for the past seven years. He’s now reached a point where he needs to increase his headcount and marketing to move his business to the next level and capitalise on the strong reputation he has established. Integral IT is looking for a loan of £20,000 to be repaid over three years. Jonathan has grown the business to turnover levels of £250,000 without, in his own words, “doing much marketing”. “I’ve relied on word of mouth and my own networking activities to get me so far, but the time is right for me to invest in the future of the business”, he said. With talks over a new £90,000 annual contract at an advanced stage, Jonathan is conscious of scaling up to meet an increase in demand by recruiting and training another member of staff. New business will come for Integral IT through two key channels according to Jonathan; online internet advertising and cloud computing. And it is cloud technology that Jonathan is very excited about being a part of. Like many SME owners, Jonathan enjoys promoting the company and winning new business so he’s setting up a service desk run with an emphasis on great customer service, staffed by ‘non-technical’ people that he wants his customers to relate to and importantly, will free up some more of his time. He’s also planning to invest in a marketing campaign, potentially hiring a marketing consultancy to spread the word further about Integral IT’s successes and vision for becoming the premier IT support company in the UK.